Two experiments test a 50-year-old theory on particles that move in a straight line. 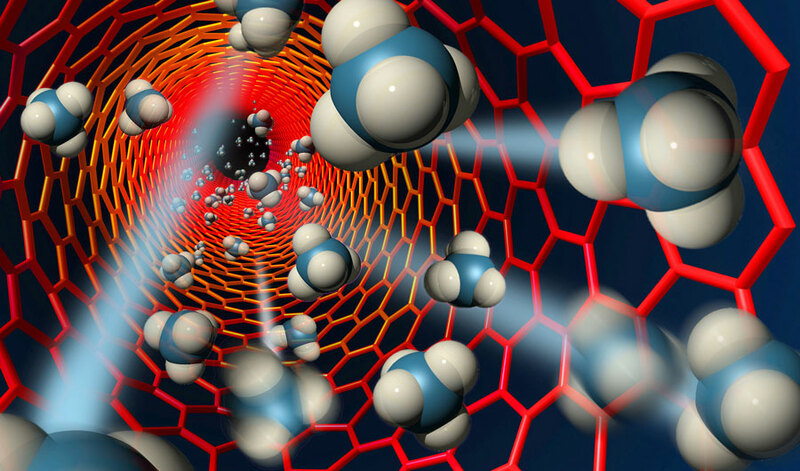 Artist's rendering of methane molecules flowing through a carbon nanotube. (Inside Science) -- Unlike one-dimensional personalities, one-dimensional materials are actually very complex -- so complex that scientists are still working to decipher their behaviors. In 1-D materials, particle movement is confined to a line. Two independent groups of researchers, one based in Australia and one in China, performed some of the first experiments to put a 50-year-old theory about such materials to the test. During a now famous speech in 1959, Richard Feynman said that "there's plenty of room at the bottom," referring to the potential to further shrink technology. He was right. Since the '50s, the size of a transistor -- a basic building block for a computer -- has gone from the size of a light bulb to smaller than a strand of DNA. "Imagine that you're in a room with other people. Sure, you may bump into another person, but nevertheless you can move around by just avoiding other people," said Giamarchi. "Now imagine being in a queue for seeing a movie -- you simply cannot move unless the whole line is also moving." With the rise of nanotechnology, scientists and engineers are racing to learn how miniaturization can transform a device's various properties. One such device is the Josephson junction, which is somewhat like the electrical energy storing component called a capacitor, but with a dose of spooky quantum magic. A single Josephson junction is composed of two layers of superconductor -- where electron pairs can move around with zero resistance -- separated by an insulating barrier. Depending on a number of conditions, electrons can sometimes "teleport" across the insulating barrier due to an effect known as quantum tunneling. Each junction is smaller than a speck of dust. By chaining thousands of them together, Duty and his team created a system that acts more or less one dimensionally and could be described with the Tomonaga-Luttinger liquid model. They studied the effect of disorder in the system -- disorder rooted in the physical imperfections and irregularities in the chain of junctions. They found that depending on the interaction strength between the electron pairs, the chain sometimes acts like a superconductor and at other times like an insulator. They also found that the sweet spot where superconductivity exists depends on the relative amount of the electron pair interactions and the disorder present in the system -- if either one is too large or too little relative to each other, the chain becomes an insulator. Using optical techniques, the researchers from China created a pancake-shaped "trap" that can suspend in mid-air about 200,000 rubidium atoms -- less than one-trillionth the number of atoms in a grain of salt. They then deployed a second laser to slice up this pancake of atoms into thin, individual lines, while keeping the levitating atoms colder than a chilling 0.1 microkelvin -- more than a million times colder than the background temperature of the universe. These feats are why scientists didn't do these experiments decades before.